Birthstones have been around since ancient times, and in those days were believed to possess magical properties that could protect the owner or wearer of the stone. These birthstones were traditionally linked to the twelve tribes of Israel or to the signs of the Zodiac. Modern monthly birthstones are linked to calendar months, each month has its own unique birthstone, with its own fabled properties. Many people love to wear jewellery set with their birthstone, as the ancient meanings and associations with these stones still intrigue them. You can get many types of jewellery containing birthstones, such as birthstone rings, a birthstone pendant and birthstone earrings. 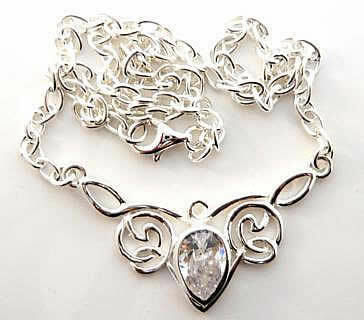 Giving someone an item of jewellery set with their birthstone (or those of their family) is a touching and wonderful gift, and whether you give them a birthstone ring, a birthstone pendant or a birthstone brooch, it is something that they are likely to treasure forever because it has real meaning and significance. Also combining two birthstones or a whole family’s birthstones can make jewellery even more unique and special. The power of internet shopping means you can buy unique birthstone jewellery online (securely as this site is accredited with Safebuy) without leaving home! Garnets are long lasting and durable gems, with a fiery, ravishing beauty. This is type of gem that the wearer will treasure forever, no matter what item of jewellery it is set into. Garnets are traditionally thought of as deep red, but actually come in a wide range of colours, so there is something to suit every taste for this month. To see my garnet jewellery click Garnet. Alternative birthstones for January if you don’t like garnet are Jasper and Ruby. You will find Jasper in the general sections on the site e.g.the Unusual stones pages and Ruby here. The amethyst birthstone comes in varying shades of purple, and can be a pale lilac in colour. On the other end of the scale, you can also get deep violet amethysts, which means that you can enjoy a birthstone that is as subtle or as rich as you like. This birthstone is very hard wearing, and its strength and durability will ensure that it lasts for a very long time. 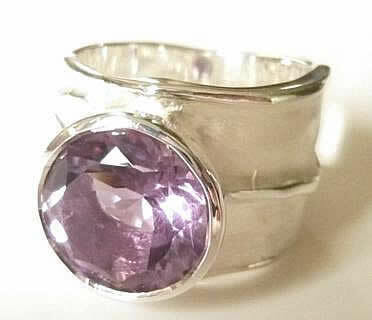 To see my amethyst jewellery click Amethyst. Alternative birthstones for February if you don’t like Amethyst are Garnet and Sapphire. 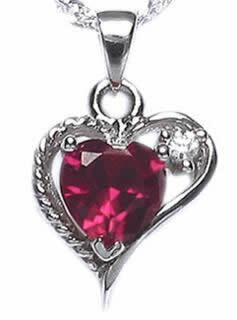 For garnet jewellery click Garnet and for Sapphire Sapphire. This month’s birthstone is aquamarine, which has been linked to the making of new friends as well as affection and love, hope and health. This stone was once also thought to protect those at sea. As the name of this birthstone suggests, it is a green-blue in colour and has a rich, sparkling look. 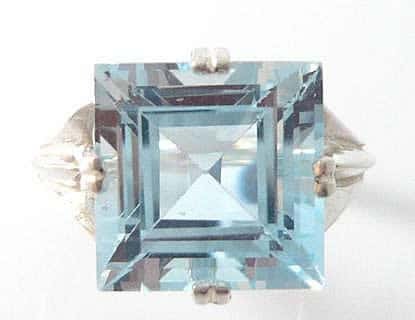 You can get aquamarine birthstones in a variety of shapes and sizes, and you can also get this stone in varying shades of green-blue. 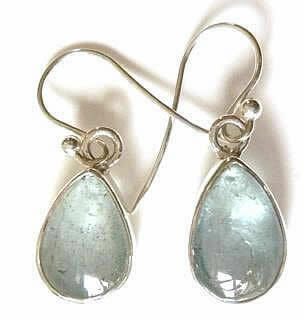 To see my aquamarine jewellery click Aquamarine. One of the most popular gems throughout history, diamonds are the birthstone for this month, and these stones are linked to love, eternity and strength. This has contributed towards diamonds being the most popular gems of all time when it comes to romance, so they are most commonly used for engagement rings, wedding bands and eternity rings. Diamonds are very strong and hard wearing, making them the perfect birthstone to wear on a daily basis. You can enjoy many different cuts of this stone, and the fiery, glamorous sparkle given off by diamonds is positively captivating. No link on this site for diamonds but the alternative stones are synthetic diamonds called CZs( CZ) ,Rock Crystal (look in the Unusual Stones sections as I usually have some in) and emerald, Emerald. This month’s birthstone is the beautiful emerald, once linked to health and the curing of ailments, as well as being associated with the ability to see in to the future, giving them an almost bewitching, magical reputation. These fiery green gems are amazing to look at, and can be found in a variety of shapes and cuts. The beauty and richness of this stone makes it the perfect gem for birthstone jewellery, and is something that the wearer can show off and take pride in for a long time. 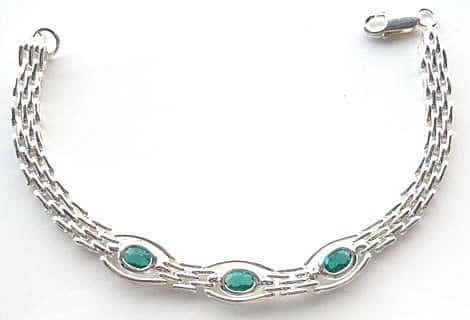 To see my emerald jewellery click Emerald. Alternative birthstones for May are Sapphire, Chalcedony and Sardonyx, look in the unusual stones sections for sardonyx items. The elegant and subtle pearl is the birthstone for the month of June, and this gem has been linked with chastity and modesty, making it something of an angelic, pure birthstone. They are also linked to successful and happy marriages. These round, stunning birthstones come in a variety of colours, and a range of sizes. Pearls can look spectacular yet modest in all manner of jewellery from birthstone rings, to earrings and necklaces, making them a perfect gift. 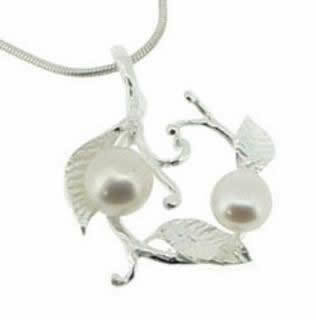 To see my pearl jewellery click pearl. The alternative stones for June are Sardonyx, Alexandrite (see the unusual stones sections on the site). Moonstone, and Emerald. Deep red in colour, rubies are stunning birthstones that will liven up and enhance any piece of jewellery. These gems have a unique, vivid and fiery appearance that would delight anyone. To see my ruby jewellery click Ruby. Alternative stones for July birthdays are Chrysolite (see unusual stones sections ) Onyx (also unusual stones) and Emerald. Lime green in colour, this birthstone is a by-product of volcanic action, and comes in all sorts of shapes and sizes. This birthstone gives off its own unique energy, and is strong and durable. 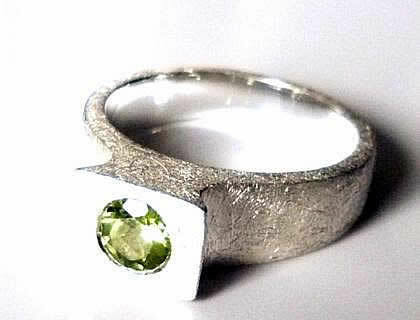 To see my peridot jewellery look at peridot. The alternative birthstones for August are Beryl, Onyx and Carnelian ( for all these see the unusual stones sections e.g., necklaces, earrings, rings, bracelets). These birthstones look stunning in all types of jewellery, especially in white gold and platinum metal. 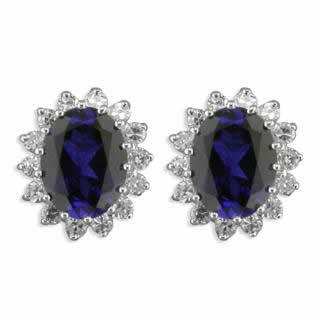 However, sapphires can come in other colours as well as blue. These are strong and durable gems that will last for years to come, and can be passed down to future generations. To see my sapphire jewellery click sapphire. The alternative birthstones for September are Topaz, Chrysolite and Carnelian both of which you find in the Unusual stones sections. The mail birthstone of October is the opal, a stone that has been linked to purity, hope and innocence. 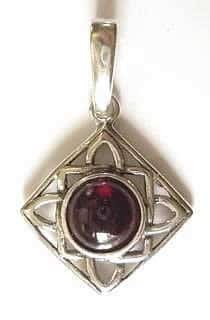 This gem has also been linked to healing forces, friendship and emotion, so it has experienced its fair share of folklore over the years. This type of birthstone comes in white or black, and both variations have remnants of other colours within them. Opals have a unique look and beauty, making them a very interesting birthstone with a strangely exquisite appearance. 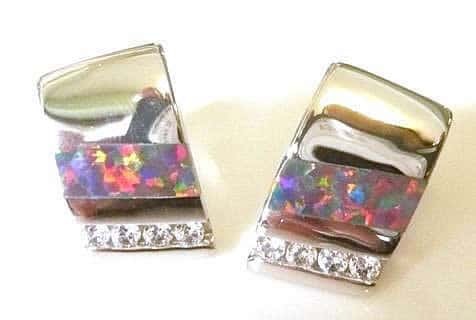 To see my opal jewellery click opal. Alternative stones to Opal are Tourmaline (Pink or Green), Chryophrase (see unusual stones sections) , Peridot and Aquamarine. The main birthstone for this month is topaz, once linked with sanity, healing, and life, as well as being connected to strength by the ancient Greeks. This stone has even been linked to an ability to make the wearer invisible in dangerous situations. This birthstone comes in a range of colours, all of which will enhance any jewel with a fiery sparkle. Colours include golden, blue, pale green, pink and red, as well as some other rare colours. A stunning gem, topaz boasts both beauty and strength. To see my topaz jewellery click topaz. Alternative stones for November are Bloodstone (green jasper dotted with red iron oxide),Citrine and Beryl (the same group as Aquamarine and Emerald). The main birthstone for December is turquoise, and this precious stone was once linked to happiness, fortune and luck, making it a very popular gem in centuries gone by. urquoise can range in colour from mid-blue to a green-blue or light green colour, and this birthstone is unusual and beautiful, making it a very distinctive and unusual addition to any jewellery collection. 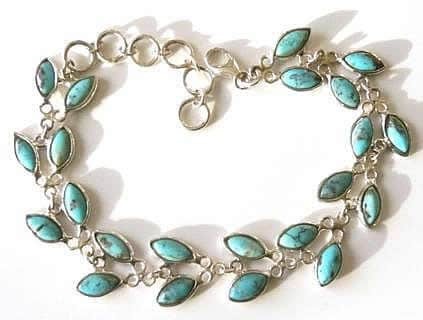 To see my turquoise jewellery look at turquoise. Alternatives stones for December are Tanzanite Amethyst, Topaz, Ruby and Zircon.